Mortis pattern dreadnoughts... supposedly the only ones who have access to them are those Chapters collectively known as "The Unforgiven." Figures the only ones who can't have them in terms of actual game play are the Dark Angels and "The Unforgiven" Chapters. But I'm not going to get into that again. This is about how I made my Mortis pattern conversions. The pic above was a simple conversion. The right lascannon arm required no work at all and the left arm is actually a missile launcher arm with a set of spare lascannon barrels (from a second lascannon arm) glued onto the face of it. Took no time at all. But this second guy took a little more time. Out of all the dreadnought patterns out there, I think this is the best looking one. I'd seen a conversion similar to this before, but it didn't strike me as having the right "feel" to it, so I never really looked seriously at making the conversion for myself. I figured I could just oder the arms from Forge World and be done with it if I really wanted to. Then I looked at what it would cost to get the arms from FW. A little too much for me. Then I stumbled upon the Aegis Defense Line at my FLGS (Game Vault) and took a look at the contents of the box. It had the right pieces and it looked like I could actually do the conversion without much trouble. So I picked up the last box. It's the first "mini" I've bought for myself in over a year. 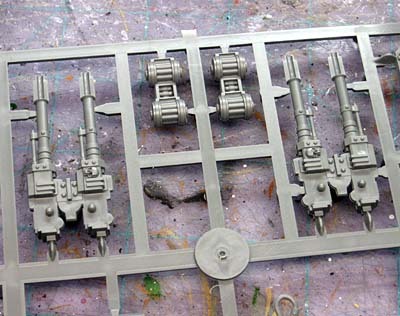 As soon as I opened the box up and took a look at the sprue, I knew I could pull it off without any trouble. My only concern was the scale of the guns in relation to the rest of the model. For the right arm, it was the back half of the lascannon arm I cut up for the previous conversion. For the left arm, it was another missile launcher arm I wasn't using. Some trimming of the gun barrels and cleaning off the face of the arm and I was all set. I glued the ammunition rolls right to the side. Then I discovered the one problem I had with the whole thing. I was using the AoBR dreadnought body and regular dreadnought arms. Who would have known the two are not compatable? Unbelievable. My quick fix was to take a piece of index card and "wrap" the pin to give it just enough additional thickness to hold the arms. The index card, once soaked in superglue becomes solid like plastic and the "regular" dreadnought arms fit prefectly now. And as a side note, you can't get the dual lascannon weapon loadout unless you use Forge World rules. I think the only version you can get by way of the Codex is the Autocannon pattern. It never ends. 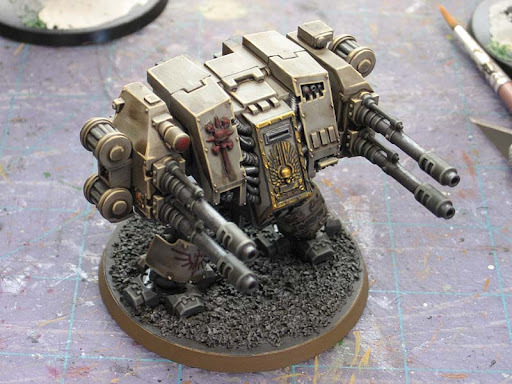 I really like the auto cannon dread, and your conversion looks great. That autocannon conversion looks BOSS!!! 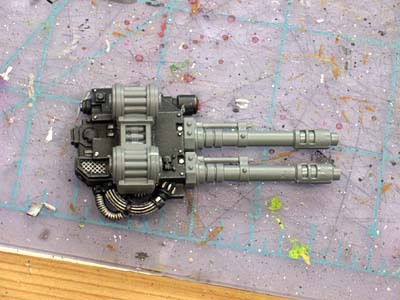 Sweet looking conversion on the autocannon. 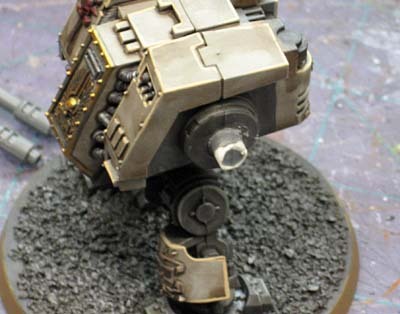 When I saw the AC Dread, I thought that he was a Forge World piece. It looks superb! I'll never understand that a regular DA army can't pick up a Mortis dread. 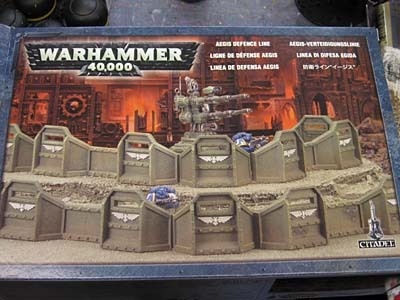 It's crazy as if GW forbid Furioso (Pre or post 1998 model) for BA. Menawhile, you can find BT LR Crusader en every army. The good point of chosing a specific marines army is that all them are different (or should be). But from some time ago, all of them tend to look like Ultramarines in other colors. That's awful, IMO. The Rifleman pattern dread is awensome. They look great, I wimped out and bought the Forgeworld ones as they were in stock at the LA battle bunker a while back and I really wanted to buy something Forgeworld. I think I bought the Imp. Arm. Vol.2 book then too and a Tempest. Thanks guys, the autocannon one is by far my favorite. I have no idea how well it'll do on the table, but it certainly looks cool and close enough to the real thing at first glance to pass as a legitimate build and that's the important part. Glad to see the Aegis defense line Dreadnought AC conversion worked out for you - I thought it might. 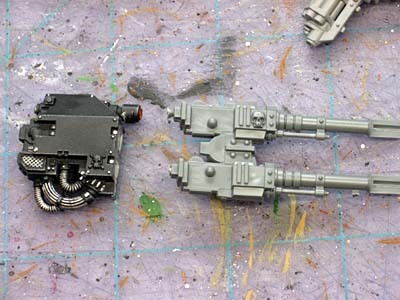 I'm still holding onto my Aegis parts to convert into a Hydra turret for a yet-unbought Renegade IG Chimera or maybe an Ork Flakka-Dakka Trukk. I picked up a WWII German halftrack I'll be having a go at kitbashing for the Ork Trukk when the time comes around. 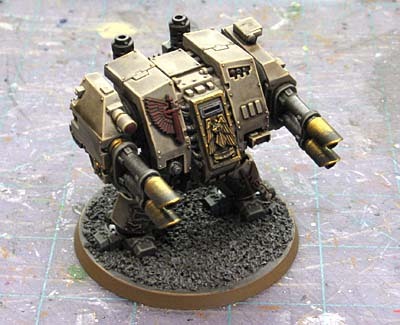 I'd ideally love to use FW Blood Slaughterer rules to get something approximating a useful CC-oriented CSM Dreadnought on the table, but I was disallowed using anything from Forge World army lists in the weekly gaming group I've started playing with, as it's a "tournament" format. I won't use the regular CSM Dread, though - I think it's asinine rule-wise that even after 10,000 years of familiarity, on a bad roll the "insane" Dread shoots up his own troops. Uh, no. I can accept "bloodthirsty" but "stupid" is a bit much. Looks good! Now you just need a wing on top to complete the "Rifleman" look from Macross/Robotech. Nice one Ron. I have actually made one using the FW arms, but I have been looking at the aegis ACs and your conversion makes the most meaning out of it. Nestor V: Thanks. It's the best I found to do it without having to sport for the Forge World pieces. Oh no!! The photos have disappeared Ron... come fix! Anon: That's a killer idea!